Smart mezzanines give a property an extra floor. Combine with flexible wall systems, mobile offices, and stable customized staircases adapted to specific demands of size and shape. A wide range of pallet racks and warehouse inventory items solves most industrial storage needs. Supplement with tool cabinets in various different designs and a wide range of plastic storage boxes. We are now recognized as a strong player within sheet metal processing and have complete lines for cutting, punching, bending and forming of sheet metal, as well as robot welding and painting of different materials. A mezzanine give your premises an extra floor in situations where you need more space for storage or machines. 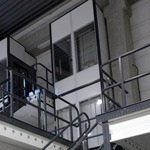 LAGERKOMPONENTER has over the years delivered a large number of mezzanines to Swedish industries. 14th of june former Robust Komponenter will change name to LAGERKOMPONENTER I NORDEN AB. The change will be followed by a new logotype, a new upgraded web page and new e-mail addresses to our staff.